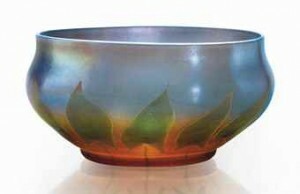 The most famous American name in the history of art glass is Louis Comfort Tiffany (1848-1933), the first and the greatest of his nation to make an original and lasting contribution to the art of glass making. In his own time, Tiffany’s products became widely popular, partly because he was active during the period of the great international exhibitions. Today, his glass is being increasingly sought after by collectors of antiques, and specimens crop up quite frequently at the dealers and in the salerooms in both Europe and America. Examples of his works can also be studied in many museums on both sides of the Atlantic. etched L.C. Tiffany – Favrile 3263E. Sold for $5,625 at Christies, New York, June 2015. Tiffany was born in New York, the son of a dealer in luxury goods and objets d’art both old and new. As a rich man’s son, he had every opportunity to develop his artistic interests and talents to the very best advantage. Through extensive travelling he became personally and directly acquainted with the arts of the Orient, which had inspired so many artists of the day, while long visits to the artistic centres of Europe gave him an intimate knowledge of the western art tradition and made him closely familiar with the fashionable style of his own time. 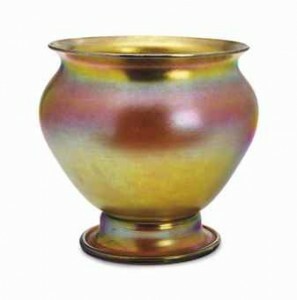 Pictured: Tiffany Studios A ‘Byzantine’ Vase, Circa 1915 Favrile glass 5 ¼ in. (13.3 cm.) high etched L.C. Tiffany Favrile 5664J. Sold for $13,750 at Christies, New York, December 2014. When the shop in New York began to sell works of contemporary French artists, this undoubtedly reflected the interest of the young Tiffany in modern arts and crafts. Tiffany’s first ambition was to become a painter and in 1866 he became the pupil of George Inncs, a landscape painter in New York, with close attachments to the Barbizon school and with a very strongly developed sense of colour. But soon Tiffany’s interests began to swing away from painting in the direction of the decorative arts. The decisive moment in this development seems to have been the Philadelphia Centennial Exhibition in 1876, where Tiffany showed some pictures and. where examples of the modern decorative arts were also to be seen. In spite of having gained a certain success as a painter, he now turned definitely to arts and crafts and in this he was greatly encouraged by his father, who wanted him to succeed him in the business. Pictured: An American Favrile Yellow Glass Vase, Signed In Etch ‘L C Tiffany Favrile’ For Tiffany Studios, New York, Circa 1895-1896, globular-shaped and footed, with an orange-fuchsia iridescence, numbered ‘X33 6868E’ 12 1/4in. (30.5cm) high. Sold for $1,000 at Christies, New York, June 2015. In 1879, Tiffany established himself in New York as an interior decorator, and ” Louis C. Tiffany & Company Associated Artists ” continued its activities until 1883. The firm provided personal designs for private interiors, churches and theatres, and occasionally Tiffany did pure architectural work. Characteristic of his style at this early period is the preference for rich and exotic colours and a wide use of varied materialswrought iron, textiles and glass. Glass was the favourite material, not only for stained glass windows, but also for mosaic work for tiles and fireplace surrounds. When employing glass, Tiffany did occasionally enhance the surface by adding a thin glaze of iridescence which gave a peculiar shimmer as of soapbubbles or of metal. Tiffany was all the time in close touch with art trends in Paris and even got French artists to provide designs for stained glass windows to be produced in his factory. In 1893 Tiffany added a glass blowing division to his plate glass works. Apparently one reason why he took up this new branch of glass-making was because he had great quantities of coloured glass left over from his stained glass production, which he wanted to use up. 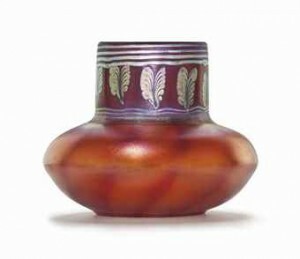 Another was surely that Emile Galle had established a new fashion in Paris for art glass vessels, which might be worth following, both from a commercial and artistic point of view. But while Galle during the 1870’s and 1880’s had been making his elaborate glass models in styles derived from the great historical modes of the past and only later on embraced the fashionable Art Nouveau style, Tiffany’s glass vessels were made in a mature Art Nouveau style from the very first. He began his production just at the time when the style had been fully developed in Paris and even his very earliest glass was perfectly suited to be displayed in Siegfried Bing’s shop ” Art Nouveau ” in Paris, which had become the centre for modern art and from which the style of the 1890s got its name. Tiffany’s glass bowls, vases and goblets were made of a fairly lightweight material in deep, exotic colours. Most of them had an iridescent surface which gave them an added evanescence and glow. The shapes were sometimes based on Islamic or Far Eastern models; at other times they had the form of flowers, the tulip being a special favourite; others again were freely formed with soft curves and indents, while some had the simple contours of Japanese pottery. The decorative motifs were usually of a floral nature or based on the patterns and colourings of peacock feathers—always a favourite theme for Art Nouveau artists. Tiffany also used purely ” abstract ” motifs quite extensively, with lines that swayed and swirled in softly undulating rhythms in the best Art Nouveau fashion. In these early days Tiffany’s glass was never decorated with external ornamentation of cutting, engraving or enamelling. Whatever the decoration, it was always applied through pure furnace work and it is this which gives Tiffany glass that softness and fluidity, which is its greatest charm. The fact that all his glass was made by the furnace from start to finish was a matter of great pride to Tiffany and he advertised it widely as ” favrile ” or hand made. The same word was used to describe his metalwork, jewellery, tiles, pottery, and all the thousand and one materials which he used for his decorative work. Sometimes he used several materials in a single vessel, glass and metal being a favourite combination. Tiffany’s glass was first shown at the Chicago Exhibition in 1893 and became an immediate success. Encouraged and inspired by praise and by riches, he proceeded to make a long series of interesting new models. His production during the latter part of the 1890’s is perhaps his finest, and during this period every design was produced in one copy only. At the exhibition in Paris in 1900 his glass became a great international success. The Tiffany Glass and Decorating Company, as his firm had been called since 1892, was awarded a Grand Prix by the jury and the products were admired by critics and laymen alike for their quality and beauty. By this time the Art Nouveau had become the popular style of the time and one reason for the general acclaim of Tiffany’s glass was, of course, that it was in the fullest accordance with the high fashion of the day. On this occasion most museums acquired one or several pieces of Tiffany glass for their collections. After the exhibition in Paris, Tiffany reorganised his firm under the name of ” Tiffany Studios ” and as such it continued its manifold activities until 1936— three years after Tiffany’s death. Glassmaking remained a chief line, but one consequence of the world wide vogue the firm’s products had won in Paris, was that it became impossible to keep up the exclusive production of unique pieces. After 1900, a number of Tiffany’s models were now made in serial production. But as every piece was hand made, each version of the same design was liable to come out a little different from the others, and a Tiffany glass retains a certain individuality, even when it is ” mass produced.” Glass in the style established during the 1890’s was continuously produced at the factory until far into the new century and long after the Art Nouveau had gone out of fashion, This later production is of course not so interesting as the glass that was made during the 1890’s, Tiffany’s most creative period as a glass artist. It was as a designer and maker of glass vessels during this time that he made his most spectacular contribution as an artist.